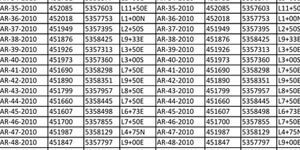 Melkiors claim group, predominantly located in Maseres Township, adjacent and south of Souart and Barry Townships in the Urban-Barry Gold Camp in Quebec, Canada. 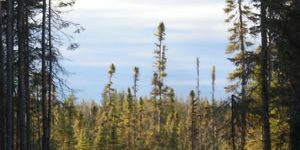 The Maseres Project is immediately south of Beaufield Resources Inc. and Great Thunder Gold Corp. claim groups that straddle the boundary of Souart and Maseres Townships. Osisko – Black Dog Project is north of Great Thunder straddling Souart and Barry Townships. The Maseres Project is considered to be “underlain by Archean-age volcanosedimentary gneisses which represent the metamorphosed southern extension of the Urban-Barry Greenstone Belt of the Abitibi Subprovince.”. A folded continuation of the geologic units that trend through Souart, Urban and Barry Townships. The Urban – Barry Greenstone Belt contains the Barry, Gladiator and Windfall deposits and is the current focus of several multi-million dollar exploration campaigns. 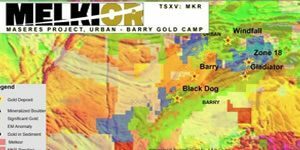 The Black Dog Project is reported by Osisko to be a gold-silver-copper discovery in andesitic volcanics that… “ coincides with magnetic and electromagnetic anomalies.. with disseminated to semi-massive Au-Ag-Cu bearing sulfides”. Historical geophysical work identified a significant conductive trend with associated electromagnetic anomalies coincident with an iron formation that crosses Osisko and Great Thunder and Melkior claim groups. Historical surface assessment work, indicates that this formational conductor is locally co-located with two mineralized boulders. The mineralized boulders are located on Osisko claims within 150 m of the Great Thunder property boundary, and 2.3 km north of Melkiors claims. Melkiors Maseres Project covers the southern half of the aforementioned formational conductor where the formational conductor appears to be significantly folded and locally disrupted. Melkiors claim group captures the majority of the fold nose of the formational conductor and the known westerly continuation of the formational conductor. 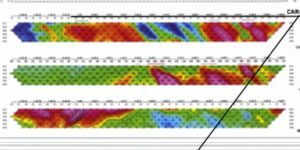 The Maseres claim group hosts two gold in sediment anomalies of 120ppb Au and 84 ppb Au “down ice” of the “formational trend” exploration target. Melkior is committed to undertaking a high definition airborne geophysical survey, summer 2017, that will cover the entire Maseres Project. 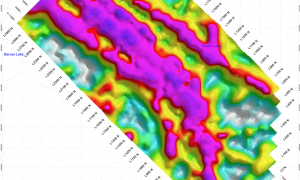 This data will provide the ground control and data needed to implement a focused follow up ground truthing and evaluation of the geophysical results.